A classic design that never disappoints, and that lends warmth, comfort and style to any corner of the house. 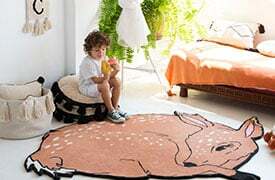 The Big Star woolen rug is made with wool of the finest quality on a 100% cotton base. Its design is simple and well-defined: a large ivory-colored star takes up the center of this rectangular rug. Hand-made using the ""Hand Tufting"" technique and with natural dyes it is perfect for the children's room, whether it be a baby, girl or boy, and also for the living room, dining room or bedroom. 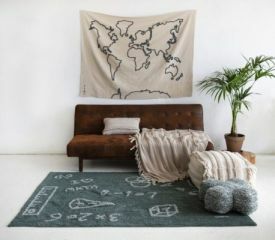 Woolen rugs are thicker and more rigid than cotton rugs, and are gaining ground in international decor circles.